The end of a marriage is an emotionally draining experience. Feelings can range from sadness and anger, to bitterness and resentment. Letting go of the life you once knew and stepping into an unknown future is one of the toughest transitions you’ll ever make. This is especially true if there are children involved. Going through the legal process of divorce can seem daunting and overwhelming, but a supportive divorce attorney can help you navigate through the uncertainty to achieve the closure you desire. laws and is familiar with the local judges and local court procedures. issues. The firm’s founder and lead St. Louis divorce attorney, Mark Haefner, is committed to providing compassionate, affordable and effective family law services for individuals and families throughout the St. Louis, MO metropolitan area. Whether your divorce is amicable or highly contentious – we’ve got you covered. how parental responsibilities are shared related to education, healthcare, etc. If you are contemplating a divorce or your spouse has asked for a divorce, contact our office at 314-200-6101 to schedule an appointment to discuss your legal options. Haefner Law Office, LLC isn’t your typical law firm. Instead of following the traditional billable hours model, we believe our clients should know the cost of the services they are paying for upfront. That’s why we developed a flat rate pricing system that puts you in the driver’s seat. We provide a menu of options that lets you choose which services you need at affordable prices. Haefner Law understands that a “one size fits all” price structure isn’t realistic — every case is different and every client has specific needs. Do You Qualify for A Divorce in St. Louis, Missouri? If you meet the above requirements, you can file a petition in the county in which you or your spouse live. A minimum of 30 days must pass before the court grants a dissolution of marriage. An uncontested divorce means that you and your spouse are in mutual agreement about the terms of your separation. You are willing to meet each other halfway to resolve all of the issues required to dissolve the marriage. 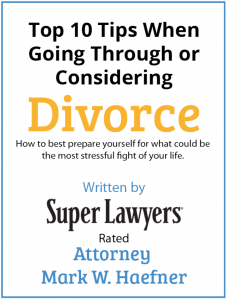 A divorce that is uncontested will save you time, money, and unwanted stress. 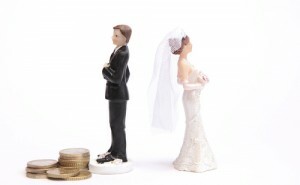 Couples that prefer uncontested divorces are usually those with few assets and no children. However, there are also those who have substantial assets and children, but just want a hassle-free divorce. Even if you and your spouse have reached compromise on all the issues, it’s important to have a skilled St. Louis divorce lawyer to properly draft and file all the necessary paperwork with the court. This will not only expedite the process, but will ensure that your rights are protected and procedural rules and laws are being upheld or followed. prepare a parenting plan, including child custody, visitation, and child support. In an uncontested divorce, there is always the chance that what began as civil can turn contentious. At that point, the court may recommend that you and your spouse engage in mediation — a settlement negotiation process facilitated by an unbiased mediator to help you reach a compromise on remaining disputes. If you have a dedicated divorce lawyer with you from the outset, you’ll be in a better position to handle the unexpected. Haefner Law Office strongly advocates for uncontested divorces, but recognizes that it’s not always the best option for everyone. Sometimes it’s just not possible for couples to reach agreement on all issues. If you expect your divorce to be contentious, you can be assured that St. Louis divorce lawyer Mark Haefner will aggressively fight to protect your future and the future of your children. To commence the contested divorce process, we will file a Petition for Dissolution of Marriage with the Court that outlines in detail your wishes regarding marital assets, child custody and support, spousal maintenance, and any other issues relevant to your case. We can also engage in a process called Discovery, which will require your spouse to provide full financial disclosure, revealing any and all of his/her financial assets and debt. During this time, we can also request temporary orders for child custody and spousal maintenance or alimony if applicable. In addition, Haefner Law works with an outside network of vocational experts, family psychologists, and accountants who can help provide additional expertise and perspective on your case. When a contested divorce goes to trial, we do our due diligence in preparation to make sure we have a winning argument. In Missouri, the law recognizes two types of property: marital and separate. Marital property is the property and debts you and your spouse acquired during your marriage. Separate property is property acquired prior to your marriage, obtained as a gift, or through an inheritance. The distribution of property and debt can have serious financial consequences for your future. If you and your spouse cannot reach an agreement on the division of marital property, the court will intervene and make the decision for you. Divorce Attorney Mark Haefner is a skillful negotiator who can advocate for your right to keep the marital assets you are entitled to. If a favorable settlement cannot be achieved, Mr. Haefner will not hesitate to vigorously litigate your interests in court. are the custodian of a disabled child who requires full-time care. Once it is determined that a spouse is eligible for maintenance, the court will then look at the finances of the would be payer spouse to determine if they have enough disposable income to assist the needs of the recipient. Maintenance can be temporary or permanent. If the maintenance order does not have a termination date and is modifiable, it can be decreased, increased, extended, or terminated based upon changing circumstances. In order to get the best maintenance order possible, it’s essential to have a knowledgeable St. Louis divorce attorney by your side who can present a clear picture to the court of your finances, skills, and what you need to fulfill our obligations. 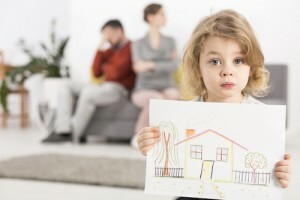 Child custody has typically been the most sensitive and contentious issue in a divorce. As a parent, there is nothing you wouldn’t do for your child. The thought of not seeing them every day can be extremely distressing. will be making the major decisions for your children concerning their upbringing. Where will they go to school? What doctor will they see? Missouri courts advocate in favor of joint legal custody or shared parental responsibility for making decisions that affect the overall welfare of your kids. Physical custody refers to where the children will live and how much time each parent will have with the children. In May 2016, the Missouri Legislature passed a bill aimed at giving divorced parents more equal custody over their children or joint physical custody. Previously, mothers were given more rights than fathers, but the new legislation, which will go into effect on August 28, 2016, is designed to level the playing field. Having said that, the court can and will make adjustments if it is not in the best interests of the children to share time with each parent. Whether through negotiation or at trial, a divorce lawyer at Haefner Law can protect your parental rights and counsel you in securing the parenting time you need. Missouri law requires parents to submit a parenting plan to the court to serve as a blueprint for how you will co-parent your children after the divorce. A parenting plan is meant to lay out specific guidelines that will lead to creating a stable and healthy environment for your kids. St. Louis divorce attorney Mike Haefner can help you craft a parenting plan that is tailored to the needs of your children and considered acceptable by the court. As parents, you and your spouse have a legal obligation to financially support your children. In a divorce, child support is typically payable from the non-custodial parent to the parent that has primary physical custody of the child. The exception is if both parents share equal time with the children and have similar incomes. To calculate child support, the Missouri Supreme Court issues guidelines or a chart that identifies basic child rearing costs in the state. These costs are inputted into “Form 14”, a worksheet that calculates a child support amount. Calculating child support is very complex, which makes it necessary to have a skilled divorce lawyer who has extensive knowledge in calculating child support payments. At Haefner Law, we make sure child support is fair, reasonable and meets the needs of the parents and children. We also handle modifications in child support when there is a material change in circumstances. If you find yourself facing a divorce or another family law issue, the Haefner Law Firm is here to help.